The No Dogs - No Dogs house, January 2016. It’s no secret that when a city starts to become the latest It City, it comes with a cost; in Nashville, that’s been the loss of quite a few of our landmark homes. Now, we’re not opposed to the city’s growth or even the high-rise apartments and modern condos that have since popped up in place of these 1920s craftsman homes, but we couldn’t just sit idly by and watch as these incredible houses were torn down and disposed of. 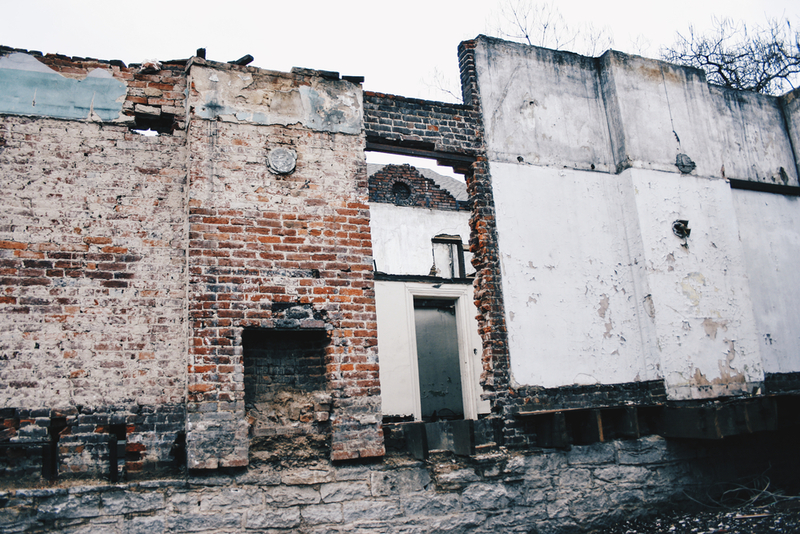 That’s why we’ve always made it a part of our mission to honor Nashville’s past with every piece that we build. Just about all of the wood that we use to create every patterned coffee table, every rustic mantle and every piece of wall art comes from a home that was recently torn down in Nashville. From just one house, we can create dozens of pieces of furniture and art, preserving a piece of Nashville’s history and giving our customers something completely unique to display in homes both in Nashville and across the country. Our most recent home is a different endeavor altogether, and it involves what we like to think of as the next, natural progression for 1767. This home was originally built in 1898 in what is now Nashville’s Germantown neighborhood, a hip and upscale area known for its warehouse-turned-artist-studios and sleek brunch spots. The low, brick duplex is riddled with damage from a fire, and it stands out like a sore thumb against the modern apartment buildings. When the home’s owner approached us to help salvage what we could from it and incorporate its charred wood into the design of the new structure, we couldn’t help but think that this is exactly the type of job we’ve always hoped that our company would someday progress into doing: one that would help us to preserve Nashville’s past in an even more permanent way. The battered, old home, with its boarded-up windows and “No Dogs - No Dogs” warnings spray painted across the front, will soon take on a new, purposeful life, and we couldn’t be happier to help the structure maintain some of its original spirit — whether it's in the form of a new floor, a wall, a mantle, or something else entirely. We're not exactly sure how the recycled wood will fit into the new design quite yet, but it's all a part of the process. Watch this space for more updates on the “No Dogs - No Dogs” House.